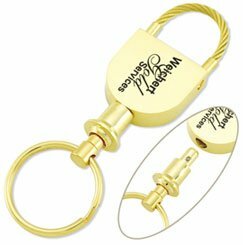 GGK007 – Hand polished solid brass key chain with gold plating. •	Free virtual samples with your logo/information are available. •	Price includes laser engraving on one side. •	No set up fee! Front Side: White laser engraved text or logo.